SPECIAL APPEAL: If you are a cruiser visiting the Rio Dulce DO NOT purchase protected species or any wildlife in general, by creating a market for these creatures you're contributing to their systematic capture and traffic. Most wild animals captured and mishandled by those involved in this type of contraband never make it alive to wherever they are going!!! As I mentioned before in an earlier article, we release captured species back into the wild on our Jungle Reserve here at Hacienda Tijax. Earlier releases have included Crocodiles, Alligator Turtles (Sambundangos), Pisotes and more recently Iguanas and a large Boa Constrictor. 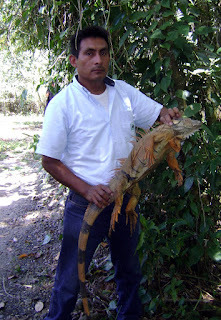 The CONAP (Consejo Nacional de Areas Protegidas) captured a haul of 250 illegally trapped iguanas last week. Unfortunately many of them died from being kept in captivity under inadecuate conditions, fortunately the CONAP staff in Rio Dulce agreed to release them almost inmediately after a medical check up (they were not doing well) and the inevitable legal paperwork to indict the persons that were allegedly trafficking this species. A big thank you to CONAP Park Director Ing. Manuel Henry for thinking of us. Finally of the 250 Iguanas only 18 made it to the Hacienda Tijax reserve and hopefully a dozen or so will survive and find a new home.